Cyril and Methodius Brotherhood (Кирило-Методіївське братство; Kyrylo-Metodiivske bratstvo). 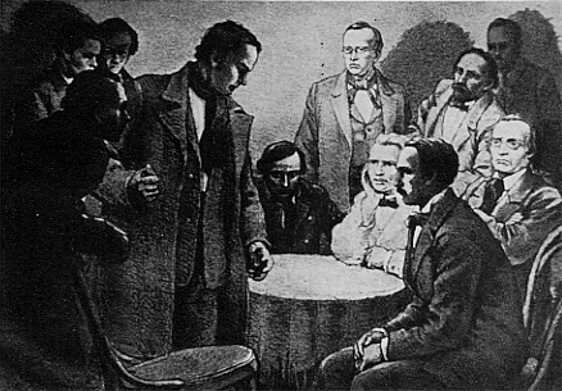 Secret society established in December 1845–January 1846 in Kyiv at the initiative of Mykola Kostomarov. The aim of the society was to transform the social order according to the Christian principles of justice, freedom, equality, and brotherhood. It proposed a series of reforms: (1) abolition of serfdom and equality of rights for all estates, (2) equal opportunity for all Slavic nations to develop their national language and culture, (3) education for the broad masses of the people, and (4) unification of all Slavs in the spirit of the Slavophilism of the time in a federated state in which Ukraine would play a leading role. Kyiv was to be the capital of the federation and the seat of the all-Slavic diet. Among others, the following individuals belonged to the brotherhood: M. Kostomarov, Vasyl Bilozersky, Oleksander Navrotsky, Mykola Hulak, Dmytro Pylchykov, O. Petrov, Panteleimon Kulish, Opanas Markovych, Yurii Andruzky, Ivan Posiada, M. Savych, and Taras Shevchenko. Since the brotherhood never reached an organizational stage requiring a clear criterion of membership, its composition cannot be determined exactly. For a long time the membership in the society of Shevchenko and Kulish was questioned, but research finally confirmed that they were members. There is but one testimony on the general size of the society—D. Pylchykov's as noted down by Oleksander Konysky—and it gives the figure of about 100 members. 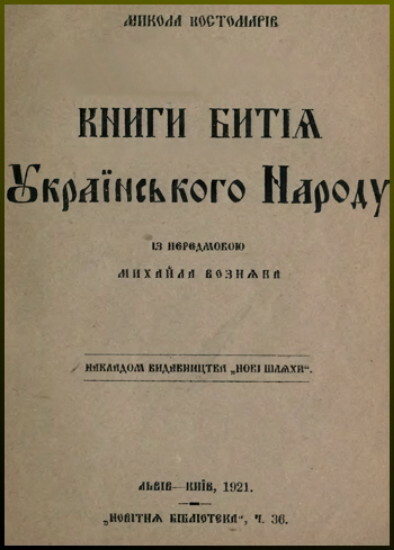 The basic documents in which the ideas and program of the society are formulated are Knyhy bytiia ukraïns'koho narodu (Books of the Genesis of the Ukrainian People) and Ustav Slov'ians'koho tovarystva sv Kyryla i Metodiia. Holovni ideï (The Statute of the Slavic Society of SS Cyril and Methodius: Its Main Ideas), both written by Kostomarov, and an explanatory memorandum to the statute written by Bilozersky. These documents and the society's activities were deeply influenced not only by the ideas of the Ukrainian renaissance of the first half of the 19th century, particularly by Istoriia Rusov (History of the Rus’ People), but also by European romanticism, especially the ideas of Pavel Šafarík and J. Kollár and Adam Mickiewicz's Księgi narodu polskiego i pielgrzymstwa polskiego (Books of the Polish People and the Polish Pilgrimage). The Decembrist movement and Pan-Slavism also had some influence on the society's outlook. The organizational looseness of the society permitted members who shared the same aims to differ markedly on the means of realizing them. Kostomarov, Bilozersky, and others stood for liberal moderate reform, while Shevchenko came out with revolutionary slogans. Somewhere between these two poles stood Mykola Hulak and Oleksander Navrotsky. Before the society could become fully active, it was denounced by O. Petrov, and its members were arrested in March 1847. After a police investigation held in Saint Petersburg, the arrested members were punished without trial by exile or imprisonment. The relatively mild punishment meted out to the society's members (Shevchenko and Kulish were punished for crimes other than membership in the society), considering the antidespotic character of the society, can be explained, on the one hand, by the government's desire to conceal from the public any antigovernment tendencies and, on the other, by its reluctance to antagonize the Slavic movement in the West, which had ties through some of its representatives with members of the brotherhood. In spite of its brief existence the society made some impact on its contemporaries, as is evident from the propagation of anti-Russian proclamations during the detention of its members, and had an even more important influence on the development of the Ukrainian movement later on. Hence, Soviet historians (Hryhorii Serhiienko, Fedir Yastrebov, P. Zaionchkovsky) partly acknowledge the ‘progressive nature’ (the struggle against despotism and national subjugation) of the society, but also underline its ‘bourgeois’ character (the absence of class conflict and its nationalist tendencies). The Cyril and Methodius Brotherhood received much attention in the later publications of its members and then in the works of Oleksander Konysky, Serhii Yefremov, Dmytro Bahalii, Mykhailo Hrushevsky, Mykhailo Vozniak, Pavlo Zaitsev, and many others. An extensive collection of documents pertaining to the Brotherhood was compiled and published (in three volumes, ed P. Sokhan) in Kyiv in 1990 as Kyrylo-Mefodiis’ke tovarystvo (Cyril and Methodius Brotherhood).